How excited was I when I went to The Memory Nest blogspot and found my layout was chosen as a "Featured Artist" for sketch "Make It Monday No. 83"!!!! I am beyond thrilled! Thanks to The Memory Nest for choosing me!! Below is the Layout that was featured using No. 84 sketch!! My Challenges: A BIG START!!! I used a Lickety Split Scrapbooks kit from years ago. 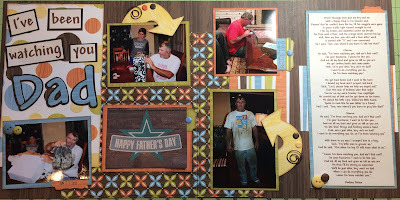 The theme was Father's Day/Father Appreciation 2 page layout!! I am so excited to actually use this kit and put it in my family album!! Here it is! 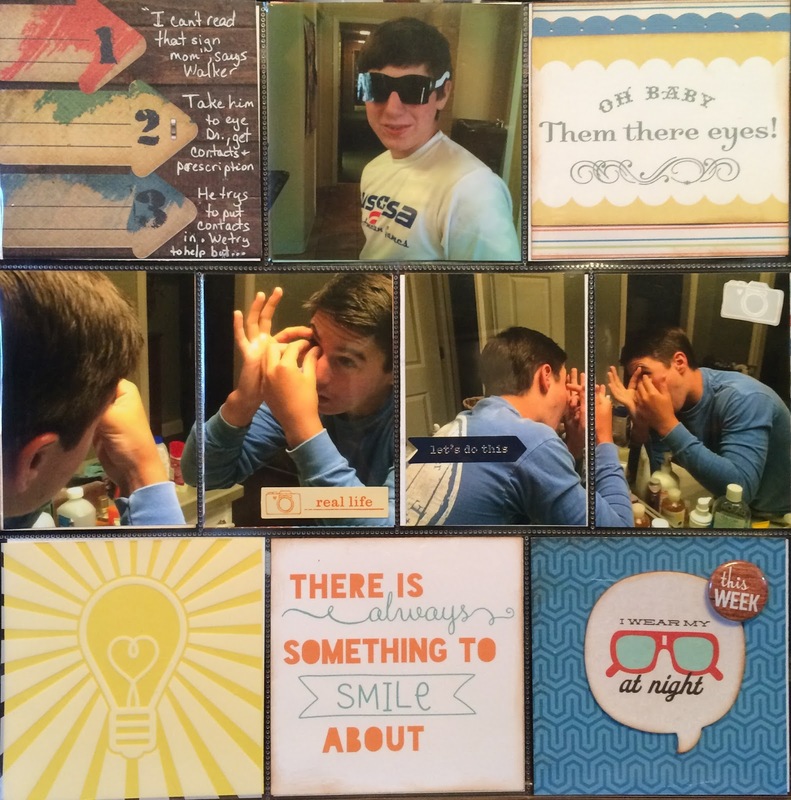 I wanted to complete the backside of a pocket page that had six 4x4 spots and 4 3x4 spots in my son's album. I used a lot of 4x4 extras and embellishments that have "just been sitting there" to fill the spots! Love using up my supplies while documenting a mini story!! LOVE IT!! These are my own individual scrapbooking challenges. I will accomplish at least 10 of these challenges by Sunday, April 23, 2017. I hope these challenges will inspire me to always scrap and create. Last day of spring break so let's get started! 5. Use a decorative punched edge. ***8. 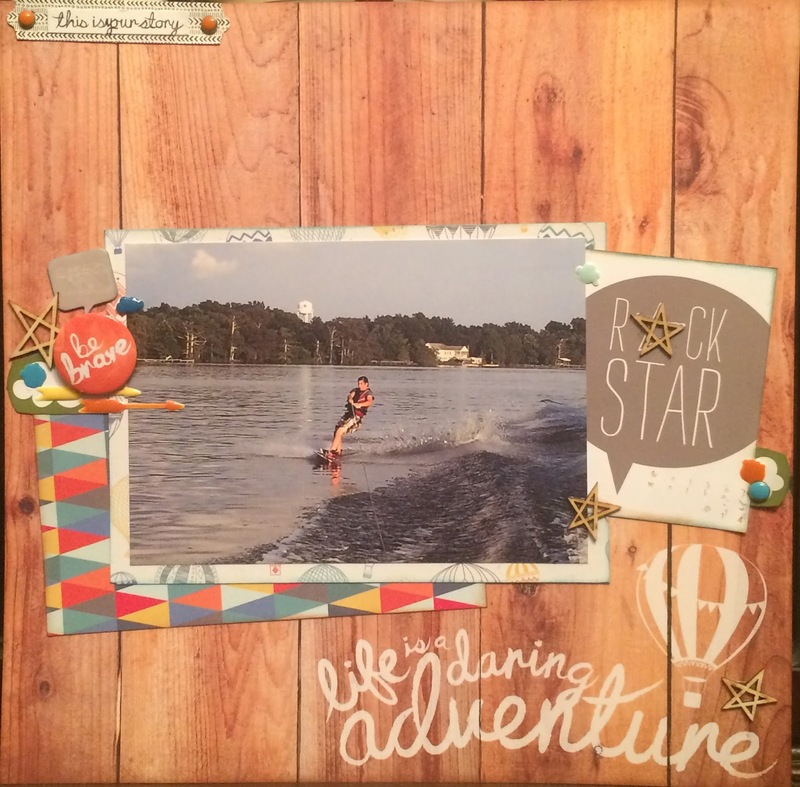 Use a silhouette cut file to create a themed layout. 9. Complete card kits for Easter gifts! 11. Create a LO of Hawaii trip. 12. Create a LO of NYC trip. 25. Use watercolor paper and inks. 26. Post all of these LOs on my blog page. ------ Strikethrough items EQUAL "I COMPLETED"
*** Star Items EQUAL "I STARTED!!" 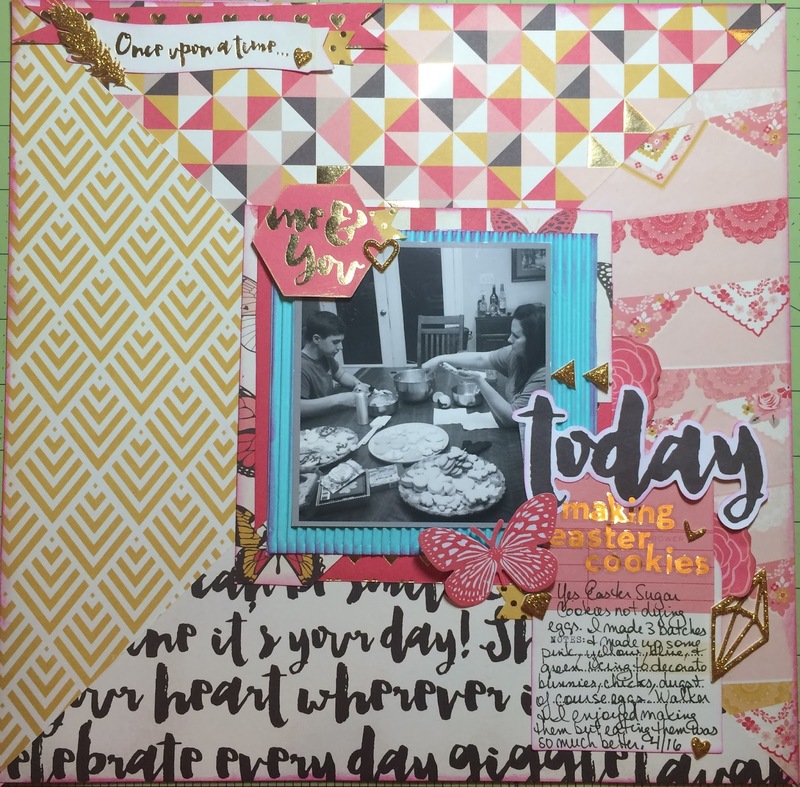 This layout is based on a sketch challenge from The Memory Nest. This is sketch #84. I am so excited to have found The Memory Nest! Inspirational sketches and layouts, which are encouraging me to scrap! In fact, several silhouette cutouts have been featured, which I hope to try!!! This is a 5x7 photo printed from my new Epson PictureMate 400 (birthday present from my husband & son). I am very happy with how it turned out! I encourage you to visit The Memory Nest for inspiration and shopping! This is a photo of my son wakeboarding on his 14th birthday last summer! Fun birthday! 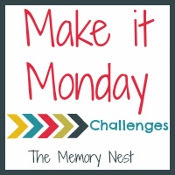 I was so excited to find the site The Memory Nest who features sketch challenges!! I LOVE a challenge!! This is Sketch Challenge #83. I encourage you to check out The Memory Nest Their sketches and blog post inspired me this past week! This is my son playing 7th grade school basketball. The only photo I have of him playing basketball. 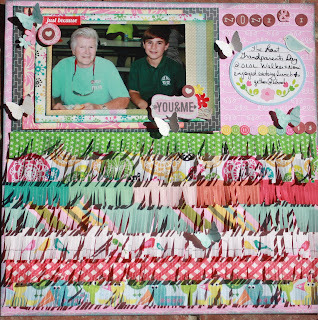 Shimelle's Challenge Fringe Strips "Noni & I"
Today I created this cute and easy page! Strips of paper, cut with my new fringe scissors (making it extremely easy) made cute fringe strips under the photo of my son with his paternal grandmother. This a photo of their last "Grandparent Day" at OLOL! I really need to make a page with all the photos throughout the years of Grandparent day! 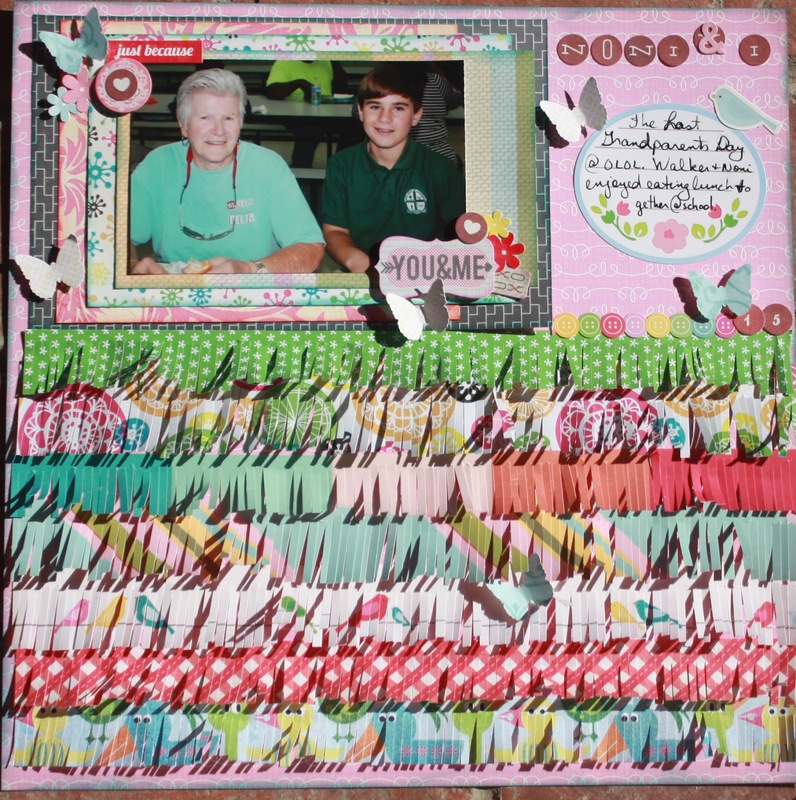 This page was based on Shimelle's Weekend Challenge, which was to use pattern paper strips and make them into fringe. The original placed fringe in a cutout shape. I will try this on another layout. I wanted the ruffle feel for this particular layout. In addition, I used one of my pre-made packs of left over paper based on a color pallet I chose from pinterest. This challenge was from a previous Shimelle class called 20 things. 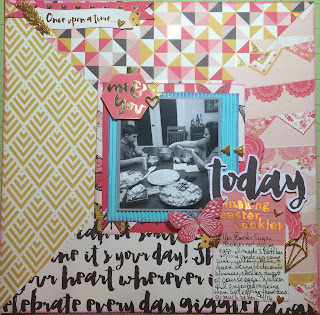 I like using up scraps in a fun way like this page! I love the use of 4 BIG triangles of BOLD pattern paper as the base of the layout. 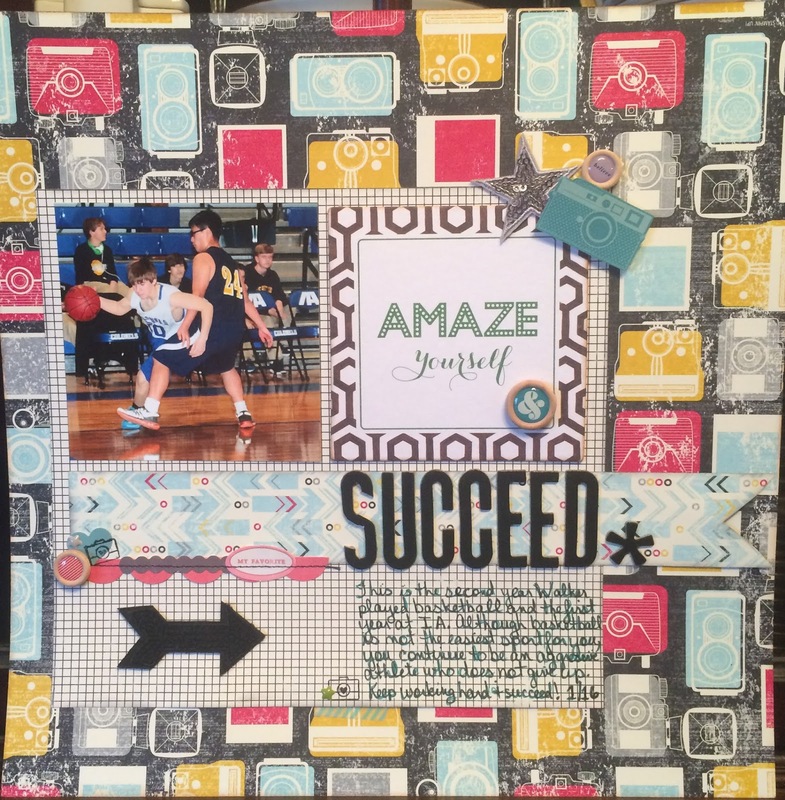 This is based on one of Shimelle's pre The 20 Project challenge weekend by Cathy Martin. I printed the black and white photo of my son and me icing/decorating Easter cookies (ducks, chicks and eggs) for a previous weekly Shimelle challenge, which I never completed. So, I consider this another twofer! I don't have too many photos of me and my son "creating" anything for a holiday; so, I really do love this photo!